Samsung has launched Galaxy J6 and Galaxy J8 Smartphones with Infinity Display in India. 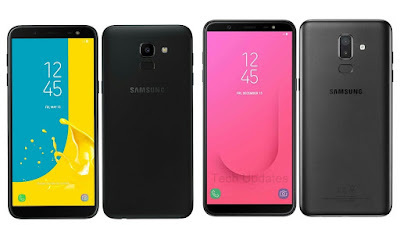 Check out Price, Specs, Features comparsion and Difference between Galaxy J6 and J8. Both Phones comes with Polycarbonate body, the Fingerprint scanner on the Rear and HD+ Super AMOLED 18.5: 9 Infinity Display. Galaxy J6 has Single Rear Camera compared to Dual Rear Camera on Galaxy J8. Both Phones has face unlock as an additional security feature. Samsung Galaxy J6 is packed with 3000mAh battery compared to 3500mAh Battery on Galaxy J8 and runs on Android 8.0 Oreo.